Facebook: This is the latest best remote/keyboard for computers, just came out! Facebook necessity. Works on everything!! Item 874: $29.99Can or $23.25us Brand New. QWERTY Remote Control with Motion Air Mouse. Get a smart remote for Skyping and Video Calling/Chatting. boxes, Windows PC, MAC, Playstation, XBOX and other devices. 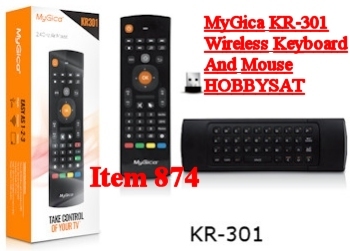 remote is similar to Nintendo Wii remote control and its Plug N Play is easy to use. 586 ATSC, 1200, 1800 and 1900ac. Also operates other Geniatech manufactured Android boxes (e.g. Pivos/Jynxbox). More sensors giving precise positioning. IR & Wireless RF capabilities. Ability to turn on/off MyGica Android boxes. 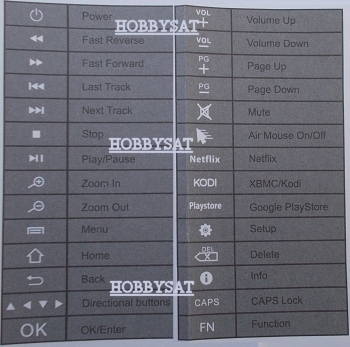 Custom Shortcut buttons for XBMC/Kodi, Google Playstore, Netflix. Ability to Turn ON & OFF the air mouse function. * Set-top-boxes for Digital and IPTV. * Man Machine Interfaces (MMI, UI). • Built-in Motion Sensor, Mouse Pointer. • 2.4 GHz + IR. • Effective Range: 10 metres or more. • Wireless Radio Frequency (RF). →Works on all Android boxes, computers, Smart TVs, etc. 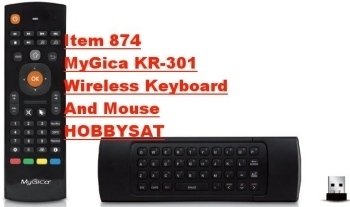 Bought this Mygica 301 Air Mouse from HobbySat online and it works on all my electronics! Thanks Hobby.